Pilgrim Cookies a Toddler Can Make! I saw these pilgrim hat cookies and thought they were adorable and something even a toddler could accomplish. I did make a few quick changes from the original I saw here. Their cookies were more accurate and cuter, but a few changes meant J could be that much more involved (and truth be told, I don’t think I could’ve iced a buckle so small). We used yellow Reeces Pieces for the buckle instead of the yellow icing and I went with a chocolate covered cookie instead of the ginger snaps (because I don’t like ginger snaps so much!). I did try cutting a marshmallow for the white band around the middle, thinking J could create every part. I couldn’t get the marshmallow to look right, so I scrapped that. Maybe someone else has good luck with it though. Squeeze a drop of icing onto the center of the cookie. Stack the Reeces Peanut Butter Cup on top (upside down). Line the base of the RPC with white icing. 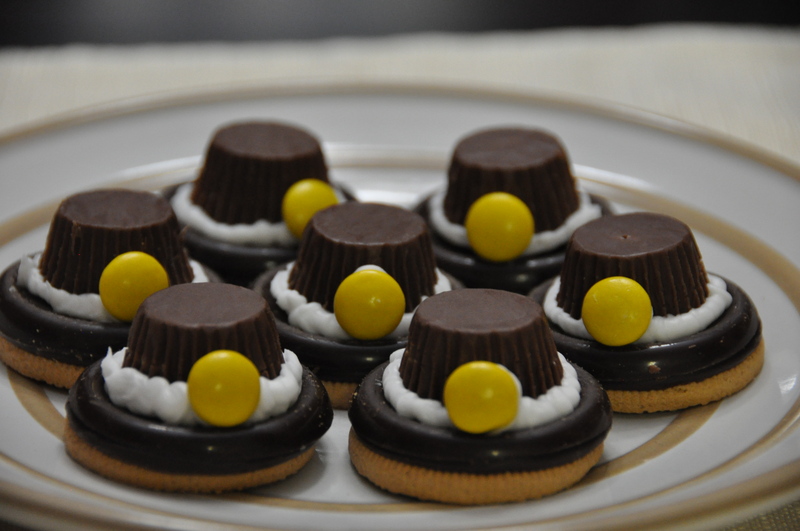 Use the icing to “glue” the yellow Reeces Pieces on as a buckle. These cookies were really good and REALLY rich (dark chocolate caramel cookie with Reeces Pieces AND Reeces peanut butter cup…. not really part of any diet). I had some friends try them and they loved them too. I’m thinking I’ll get the kids working on these the morning of Thanksgiving so they can have a part in preparing the meal (the best part of the meal… dessert!). They have the side benefit of providing the opportunity talk about the origin of Thanksgiving. I used it as a review of who the pilgrims were. This is really the first year I included lessons on Thanksgiving prior to Thanksgiving day. The majority of what we do comes in day to day conversations. I’ve used books, pictures, activities, games, and videos to give J a visual image of the different aspects of Thanksgiving. You don’t have to do ALL of them, one book or one activity is enough to jump start many conversations throughout your day. In my experience, those conversations are where they learn the most. They are often asking questions and therefore paying close attention to the answers. It’s all really simple and easy to do. Here are a few resources I used to help me introduce the history and purpose of Thanksgiving to J (at 2.5 yrs old). You might have seen most of these links on my Thanksgiving index post, but I wanted to highlight a few that have been helpful for us in teaching. I will recount all of your wonderful deeds. —Psalm 9:1” You don’t have to WOW them with fancy crafts, the beauty of a toddler! I wrote the scripture on construction paper, we talked about it and then taped it up where near where he plays. There’s a cup of strips nearby to add new things as inspiration strikes him. My goal is to help him learn how to recognize things he’s thankful for all throughout the day and to thank God right then and there. This means we stop whatever we’re doing to add to the poster. It’s worth that tiny effort. I review the scripture each time and we say a quick thank you prayer for that particular “wonderful deed” God did (or allowed in J’s life). “If I Were a Butterfly” – This is an adorable song that kids love about being thankful for how God made us. I played this song for him (used just the audio from youtube since the pictures weren’t great IMO) and had pictures of the different animals up on the computer. I just copied the pictures real quick from google images. He could follow along with the song by pointing at the different animals. Now we sing it together all the time. Sometimes we pull the pictures out again and he can choose which animal to sing about next, sometimes he calls out a random animal and I make up a verse about it. We make it a fun game this way. 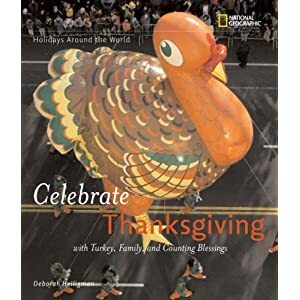 “Celebrate Thanksgiving with Turkey, Family, and Counting Blessings” by Deborah Heiligman – I like to use non-fiction books as well as fiction, just to get J used to seeing both type of books. This is a book published by National Geographic that takes you from Pilgrims on the Mayflower to the Thanksgiving parade to pumpkin pie. I wouldn’t buy this book, but it’s a helpful library check-out this time of year. “The Story of Thanksgiving Basically” – This is a cute cartoon video that tells the BASIC story (with some humor) and does a decent job connecting it to our lives today. It’s no more than 2 minutes long, so will easily keep the attention of young ones. Pilgrim, Pilgrim – This is a create your own coloring book about the pilgrims. It’s told in a similar fashion to Brown Bear, Brown Bear. I was surprised at how into coloring J was on this activity. We just added a few quick staples and were done, nothing flashy. We now have a good review book. Crafty Canned Food Drive – I love this (scroll down to the bottom of that link to see the canned food “craft”). This is so simple, yet a great way to incorporate the lesson of WHY we give and be a witnessing tool as well. You can bring this back to the history of Thanksgiving by explaining how we can be a blessing by bringing food to others, just like the Native Americans blessed the Pilgrims. Thanksgiving through pictures – J loved this game and still asks to play a full week later. You can choose whichever Thanksgiving images you want to reinforce whichever aspect of Thanksgiving you want. I made both cards for the historical aspect of Thanksgiving as well as images of things J will actually see when the family gets together. 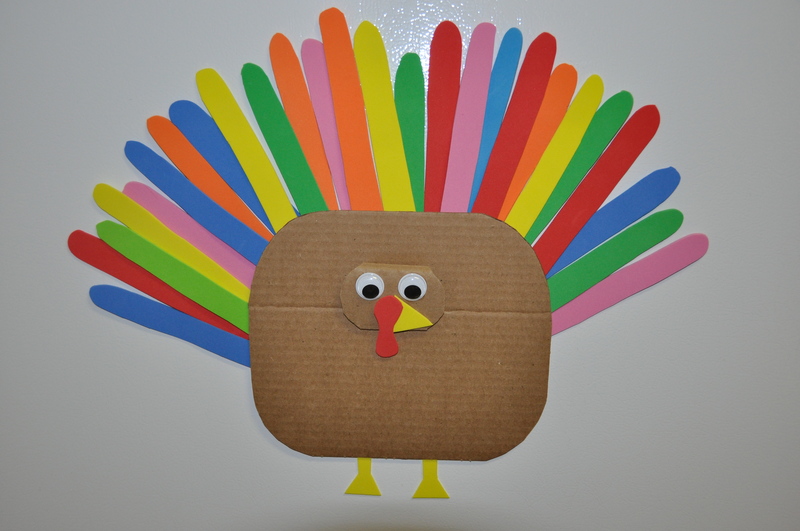 Thanksgiving Worksheet Packet – These are printable worksheets that add Thanksgiving imagery to basic skills like letters, writing, colors, sorting, and counting. They are really well done. We won’t be doing all of the pages, but I’ve chosen a few that will challenge J. Each holiday (or season) I make a list of activities I might do with J. I try to include books, videos, crafts, games, printables, field trips, and scripture/Bible stories that apply. I never get all of the activities accomplished. I don’t really intend to do so when I create the list. It’s just nice to have a quick go-to list when I’m planning out our weeks. On the weeks I don’t get around to planning at all, I have a list to quickly pull from when the fancy strikes (or the toddler needs to be put to work!). I create the lists in powerpoint because, well, it’s my favorite. I include any links to printables or the original idea right there in the list. Any manipulatives that need to be created can be done there in the same file. So when I open up my Autumn activities ppt, I have one page of activities specific to the season itself, one for Halloween and one for Thanksgiving. All the remaining pages have manipulatives I created for the activities, as well as clip art and photos that might come in handy too. Since the planning calendar I have is from I can easily fit that season’s activities into the calendar on the same file. As we complete an activity I change the color font for quick reference. So far, we’ve completed the orange activities this year. I save the lists in case we want to reuse activities next year or complete activities we didn’t get to. I can always add to it throughout the year if something extra special comes to mind. I do try to keep the list reasonable and only include activities that are helpful in teaching (and, lets be honest, activities I think are just plain cute!). You’ll notice that I DO NOT create all the activities myself. Check out the links to some great activities! I might highlight a few later as I complete them, but no need to wait for me! Thanksgiving is coming soon!